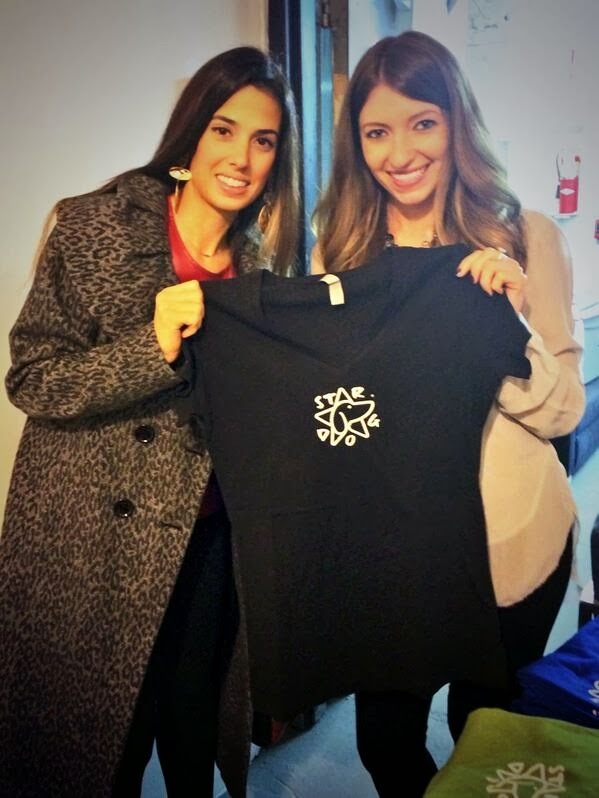 It was a fun filled night of networking for local bloggers and businesses. The room was filed with lots of laughs, music by Ninety-Three Entertainment, complimentary head shots by Gomez-Photography, swags and giveaways. Listening to bloggers speak of how they began, how they find their inspiration and what keeps them going was eye opening. 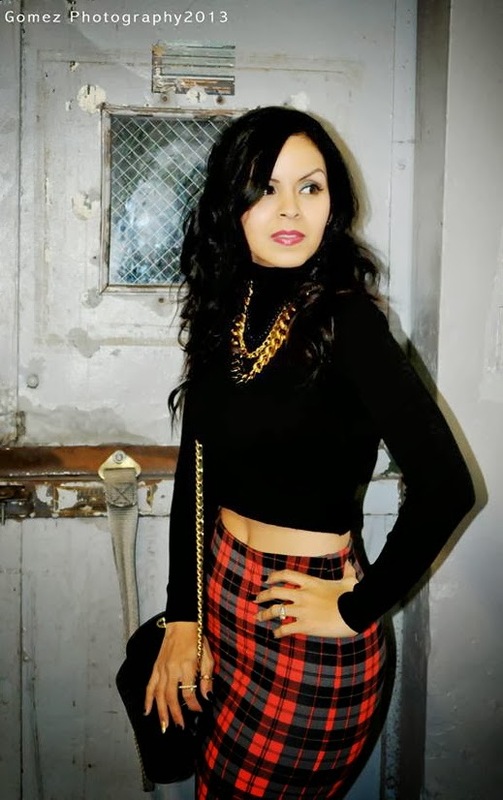 I loved hearing how fellow bloggers got their start and why they love what they do. 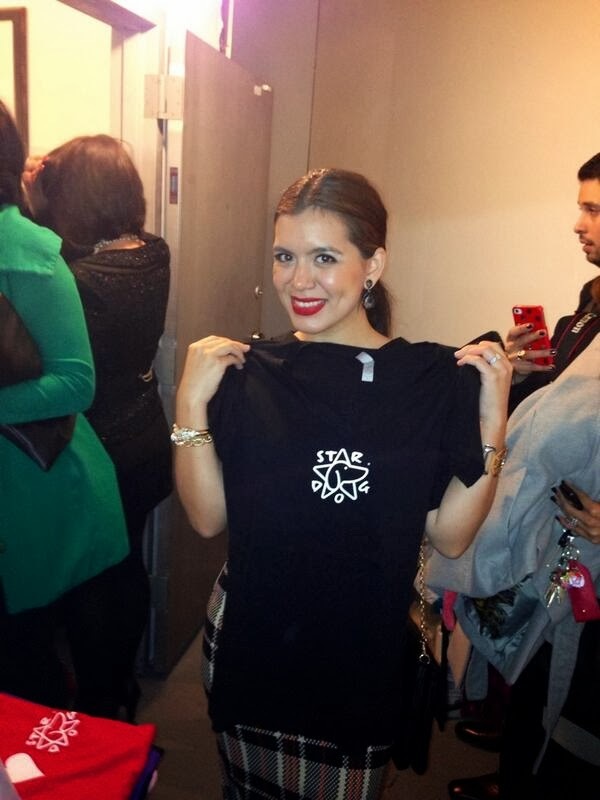 The dedication and the love of blogging left the guests felling inspired. The highlight of the event for me, however, was being asked to speak. 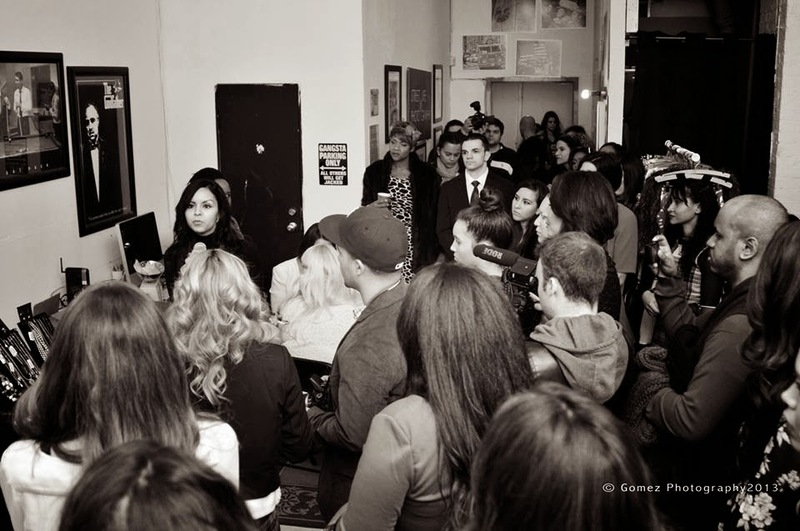 I was a little nervous in front so many people who express themselves so elegantly for a living. But Once I started talking about all Star Dog accomplished in 2013, it was easy. The attentiveness and kindness of the ladies put me at ease immediately! It was really a great opportunity for Star Dog to be amongst so many talented people who love what they do. We made new friends, new contacts and picked up a few blogging tips. One of the most important things I learned that evening is the value of establishing relationships. It is wonderful when women come together to build each other up and work together to help each other succeed. Creating strong relationships between bloggers and businesses makes us all better. Everyone was super sweet, kind and uplifiting. 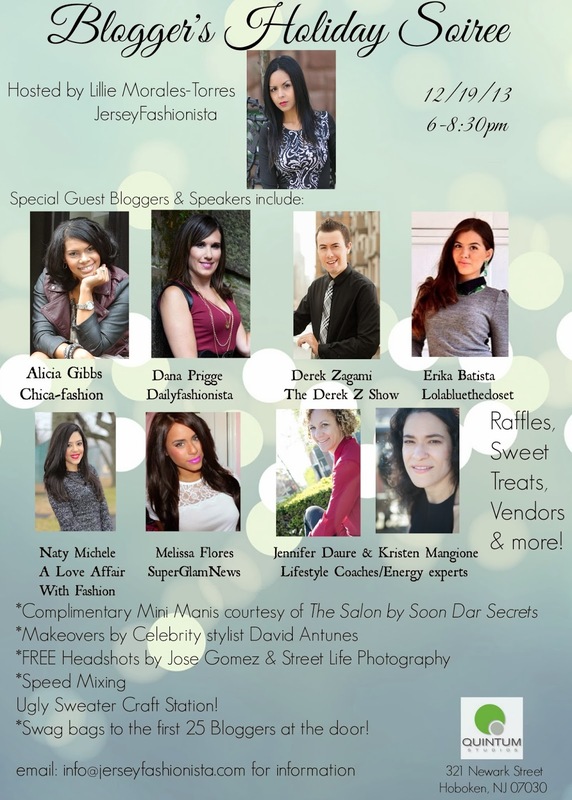 Attending this event was a great way to close to 2013. 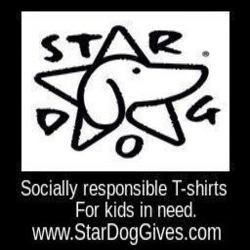 I am so appreciative on what an incredible year this has been, how many new friends Star Dog has made, and about the energy we have for 2014! We are all aware of the serious health risks posed by warm weather and leaving pets in hot cars, but did you know that extreme cold weather also poses serious risk to the health of your pets? If the weather conditions are intolerable for you, then they may also be dangerous for your pets. At Star Dog we are not only passionate about helping children, we are also passionate about keeping our pets safe. In July, I wrote a pet safety blog post after New Jersey experienced five 90 degree days in a row. Now that New Jersey is experiencing close to 2 weeks of below freezing temperatures (Brrr - it's polar bear weather) It has prompted me to share what I have learned about keeping our pets warm and comfy. We are all aware of the serious risks of leaving a pet in a hot car. Did you know that car can act as a refrigerator in the winter and cause your pet to freeze to death? If you wouldn't sit in the car without the heat, you shouldn't expect your pet to either. Extreme cold weather can be deadly. Limit the amount of time you allow your pet to spend in the cold. When you let your dogs out stay out with them. 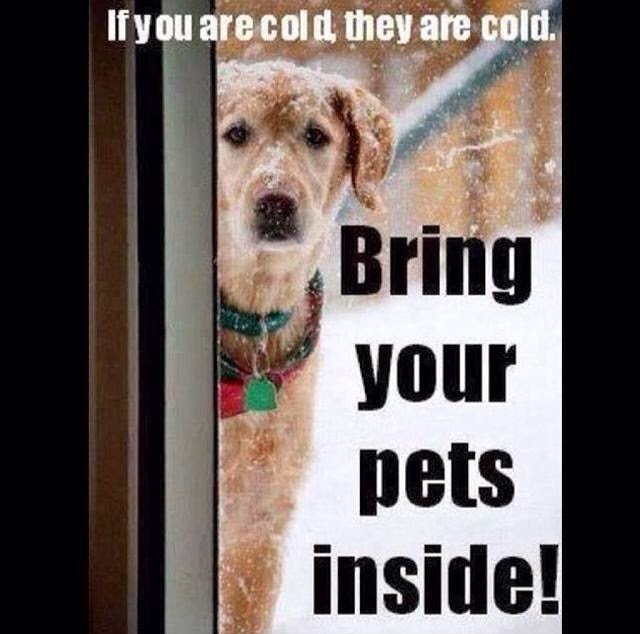 If you're too cold to stand out there, then it's probably too cold for your pet to stay out much longer. Remember that animals can suffer from hypothermia and frostbite just like people. 1. Know the limits: Just like people, pets’ cold tolerance can vary from pet to pet based on their coat, body fat stores, activity level, and health. Be aware of your pet’s tolerance for cold weather, and adjust accordingly. You will probably need to shorten your dog’s walks in very cold weather to protect you both from weather-associated health risks. Arthritic and elderly pets may have more difficulty walking on snow and ice and may be more prone to slipping and falling. Long-haired or thick-coated dogs tend to be more cold-tolerant, but are still at risk in cold weather. Short-haired pets feel the cold faster because they have less protection, and short-legged pets may become cold faster because their bellies and bodies are more likely to come into contact with snow-covered ground. Pets with diabetes, heart disease, kidney disease, or hormonal imbalances (such as Cushing’s disease) may have a harder time regulating their body temperature, and may be more susceptible to problems from temperature extremes. The same goes for very young and very old pets. If you need help determining your pet’s temperature limits, consult your veterinarian. 2. Provide choices: Just like you, pets prefer comfortable sleeping places and may change their location based on their need for more or less warmth. Give them some safe options to allow them to vary their sleeping place to adjust to their needs. 3. Stay inside: Cats and dogs should be kept inside during cold weather. It’s a common belief that dogs and cats are resistant than people to cold weather because of their fur, but it’s untrue. Like people, cats and dogs are susceptible to frostbite and hypothermia and should be kept inside. Longer-haired and thick-coated dog breeds, such as huskies and other dogs bred for colder climates, are more tolerant of cold weather; but no pet should be left outside for long periods of time in below-freezing weather. 4. Make some noise: A warm vehicle engine can be an appealing heat source for outdoor and feral cats, but it’s deadly. Check underneath your car, bang on the hood, and honk the horn before starting the engine to encourage feline hitchhikers to abandon their roost under the hood. 5. Check the paws: Check your dog’s paws frequently for signs of cold-weather injury or damage, such as cracked paw pads or bleeding. During a walk, a sudden lameness may be due to an injury or may be due to ice accumulation between his/her toes. You may be able to reduce the chance of iceball accumulation by clipping the hair between your dog’s toes. 6. Play dress-up: If your dog has a short coat or seems bothered by the cold weather, consider a sweater or dog coat. Have several on hand, so you can use a dry sweater or coat each time your dog goes outside. Wet sweaters or coats can actually make your dog colder. Some pet owners also use booties to protect their dog’s feet; if you choose to use them, make sure they fit properly. 7. Wipe down: During walks, your dog’s feet, legs and belly may pick up deicers, antifreeze, or other chemicals that could be toxic. When you get back inside, wipe down (or wash) your pet’s feet, legs and belly to remove these chemicals and reduce the risk that your dog will be poisoned after (s)he licks them off of his/her feet or fur. Consider using pet-safe deicers on your property to protect your pets and the others in your neighborhood. 8. Check Collars and chips: Many pets become lost in winter because snow and ice can hide recognizable scents that might normally help your pet find his/her way back home. Make sure your pet has a well-fitting collar with up-to-date identification and contact information. A microchip is a more permanent means of identification, but it’s critical that you keep the registration up to date. 9. Stay home: Hot cars are a known threat to pets, but cold cars also pose significant risk to your pet’s health. You’re already familiar with how a car can rapidly cool down in cold weather; it becomes like a refrigerator, and can rapidly chill your pet. Pets that are young, old, ill, or thin are particularly susceptible to cold environments and should never be left in cold cars. Limit car travel to only that which is necessary, and don’t leave your pet unattended in the vehicle. 10. Prevent poisoning: Clean up any antifreeze spills quickly, as even small amounts of antifreeze can be deadly. Make sure your pets don’t have access to medication bottles, household chemicals, potentially toxic foods such as onions, xylitol (a sugar substitute) and chocolate. 11. Protect family: Odds are your pet will be spending more time inside during the winter, so it’s a good time to make sure your house is properly pet-proofed. Use space heaters with caution around pets, because they can burn or they can be knocked over, potentially starting a fire. Check your furnace before the cold weather sets in to make sure it’s working efficiently, and install carbon monoxide detectors to keep your entire family safe from harm. If you have a pet bird, make sure its cage is away from drafts. 12. Avoid ice: When walking your dog, stay away from frozen ponds, lakes and other water. You don’t know if the ice will support your dog’s weight, and if your dog breaks through the ice it could be deadly. And if this happens and you instinctively try to save your dog, both of your lives could be in jeopardy. 13. Provide shelter: We don’t recommend keeping any pet outside for long periods of time, but if you are unable to keep your dog inside during cold weather, provide him/her with a warm, solid shelter against wind. Make sure that they have unlimited access to fresh, non-frozen water (by changing the water frequently or using a pet-safe, heated water bowl). The floor of the shelter should be off of the ground (to minimize heat loss into the ground) and the bedding should be thick, dry and changed regularly to provide a warm, dry environment. The door to the shelter should be positioned away from prevailing winds. Space heaters and heat lamps should be avoided because of the risk of burns or fire. Heated pet mats should also be used with caution because they are still capable of causing burns. 14. 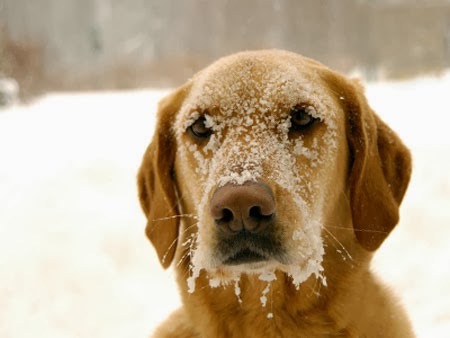 Recognize problems: If your pet is whining, shivering, seems anxious, slows down or stops moving, seems weak, or starts looking for warm places to burrow, get them back inside quickly because they are showing signs of hypothermia. Frostbite is harder to detect, and may not be fully recognized until a few days after the damage is done. If you suspect your pet has hypothermia or frostbite, consult your veterinarian immediately. 15. Be prepared: Cold weather also brings the risks of severe winter weather, blizzards and power outages. Prepare a disaster/emergency kit, and include your pet in your plans. Have enough food, water and medicine (including any prescription medications as well as heartworm and flea/tick preventives) on hand to get through at least 5 days. 16. Feed well: Keep your pet at a healthy weight throughout the winter. Some pet owners feel that a little extra weight gives their pet some extra protection from cold, but the health risks associated with that extra weight don’t make it worth doing. Watch your pet’s body condition and keep them in the healthy range. Outdoor pets will require more calories in the winter to generate enough body heat and energy to keep them warm – talk to your veterinarian about your pet’s nutritional needs during cold weather. 17. Winter wellness: Has your pet had his/her preventive care exam (wellness exam) yet? Cold weather may worsen some medical conditions such as arthritis. Your pet should be examined by a veterinarian at least once a year, and it’s as good a time as any to get him/her checked out to make sure (s)he is ready and as healthy as possible for cold weather. Protecting your pets from the cold is not only responsible pet ownership - it's the law. Failure to provide adequate food, water and shelter from the elements is considered animal cruelty. Treat your pet the way you would want to be treated if you were in their paws! Star Dog had a fabulous year of giving! 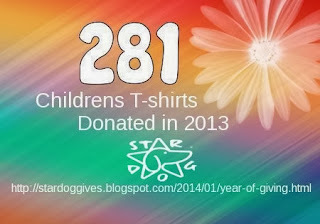 We donated 281 brand new t-shirts to kids in need! Thank you to all who cared and helped make this happen. 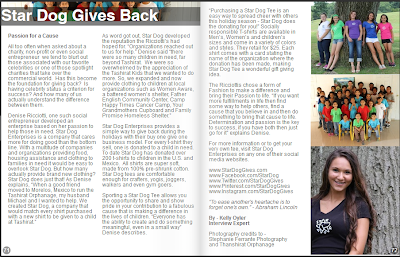 Here is a list of places Star Dog, with the help of our supporters, donated to in 2013. Our goal is to have a bigger and stronger 2014 by doubling our donations.You can help by purchasing a t-shirt on our website. The more we sell the more we give. Click on photo above to read full article.